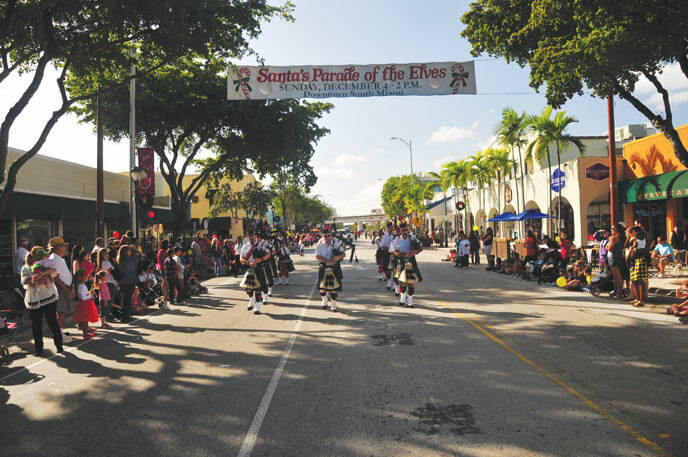 In the early years south miami commissioner carl b. Schwait would lead the elves down sunset drive. The Rose Bowl, Macy’s and Saint Patrick’s Day Parades are highly professional, large-scale events broadcast into American homes. 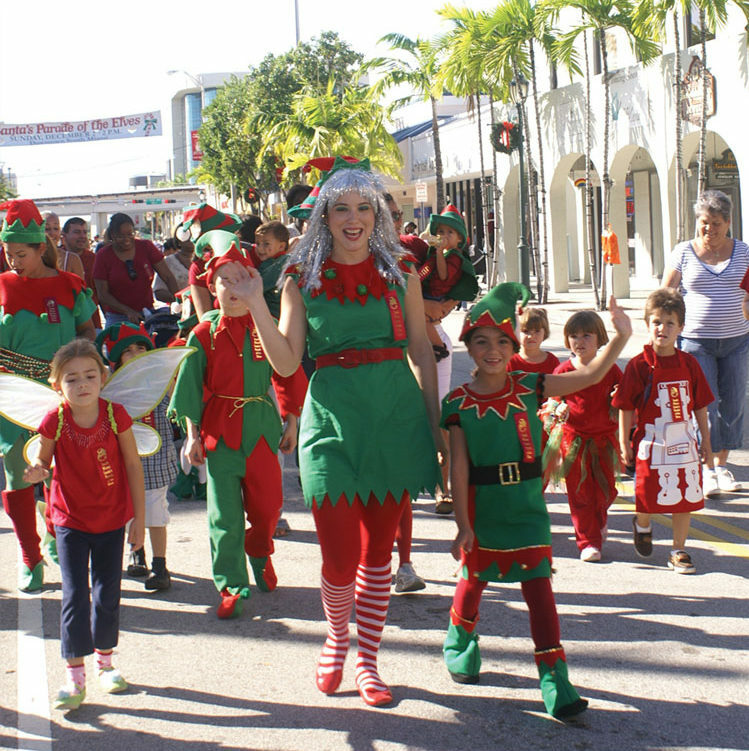 Captivating as they are, there is something particularly appealing about a hometown and homegrown pageant like South Miami’s Parade of the Elves. This is an event replete with local kids dressed as little sprites waving madly at everyone, beauty queens precariously perched back seats of convertibles, and music from budding young trumpet and clarinet players struggling to keep in step with the beat. Participating in the parade or cheering it on from the sidelines connects people to their community—something that seems to be in short supply in this time of electronically-induced isolationism. John Sorgie (now deceased) of Sunset Quickprint and then President of the RSMA took responsibility for organizing the parade. “The parade was one of my greatest achievements and it couldn’t have been a success without the help of people like my right-hand person Suzi Rubenstein and our other dedicated volunteers,” said Sorgie in 2013. 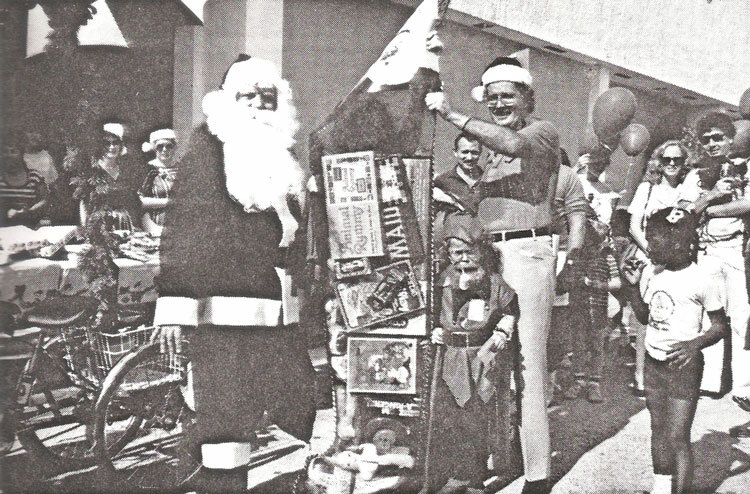 Rubenstein, then owner of the Nautical Loft, was joined by John Edward Smith, an image marketing consultant, Jeanne Jolliff of Capital Bank, Trish Menninger of Chase Bank, Lydia White of Robert’s Western Wear, and Bill Enright of South Miami Hospital, who later took over the role of Santa for some five years. 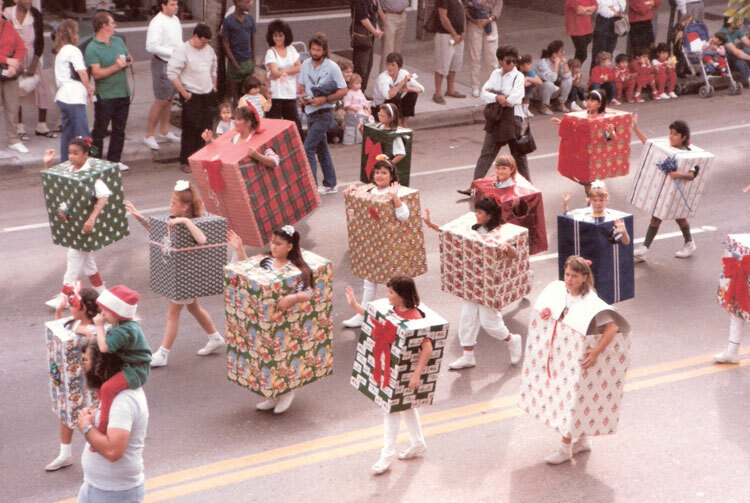 Merchants, institutions and elected officials pooled their resources and good offices to make the parade an annual event. 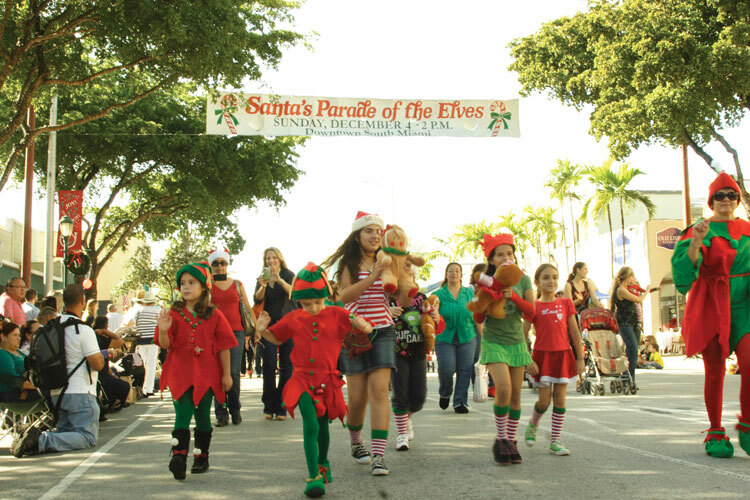 Early on, the name of the event changed from “Santa Parade and Cutest Elf Contest” to simply, “SANTA’S Parade of the Elves.” The Cutest Elf Contest was discontinued as singling out one child put the celebrity judges in jeopardy. Instead each elf was given a participatory commemorative ribbon. In deference to affected merchants, the date moved from the first Saturday in December to the first Sunday; and the route went through a number of revisions. 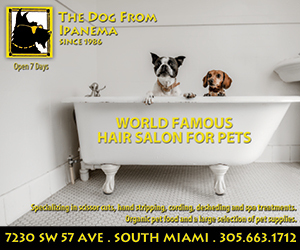 “I have such nice memories of the parade: Dave Barry was Grand Marshal and he was to ride in a yellow Volkswagen convertible. Unfortunately it had a standard transmission and the only person available who knew how to drive a stick shift was me—so I got to be Mr. Barry’s driver,” said Lydia White (now retired and living in Louisville), whose business, Roberts Western Wear, sponsored the South Florida Trail Riders for many years. 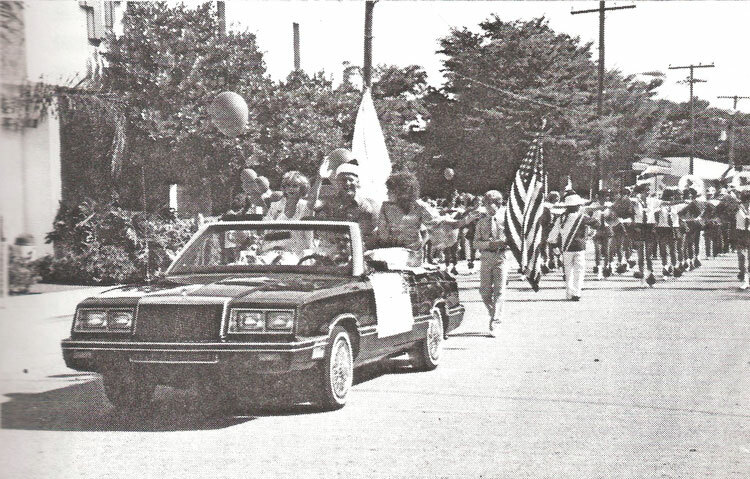 SOMI Magazine Publisher John Edward Smith had the joy of driving his seven-month old daughter (the youngest elf) Ashley in the Grand Marshal’s convertible in the very first parade. 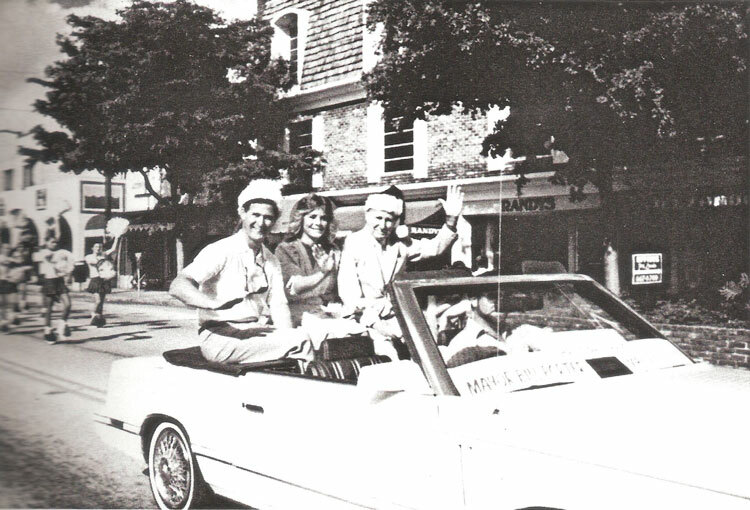 “Skipper Chuck” Zink was the first Grand Marshal. Skipper Chuck hosted a television show for children called Popeye Playhouse from 1957 to 1979 and hosted the Orange Bowl Parade for 22 years. Other parades followed and Grand Marshals included WTVJ’s legendary Ralph Renick, South Miami local baseball Hall of Famer Andre Dawson, and the Miami Herald’s Dave Barry. What if people waited for a parade, but nobody marched? That’s exactly what happened in 1989, when the parade was cancelled due to sufficient sponsorship. On-lookers filled the downtown sidewalks patiently awaiting the march of the little elves that never arrived. 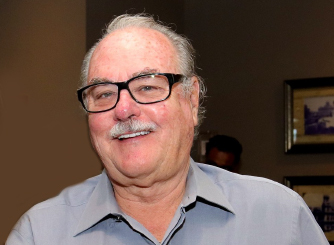 This was a turn of events that so concerned newly-elected South Miami Mayor Cathy McCann (1990), that she vowed it would never happen again. At this point the City of South Miami government took the responsibility for ensuring that the show must and would go on. Enter the City as the organizer and Barbara Acker as Parade Coordinator par excellence. 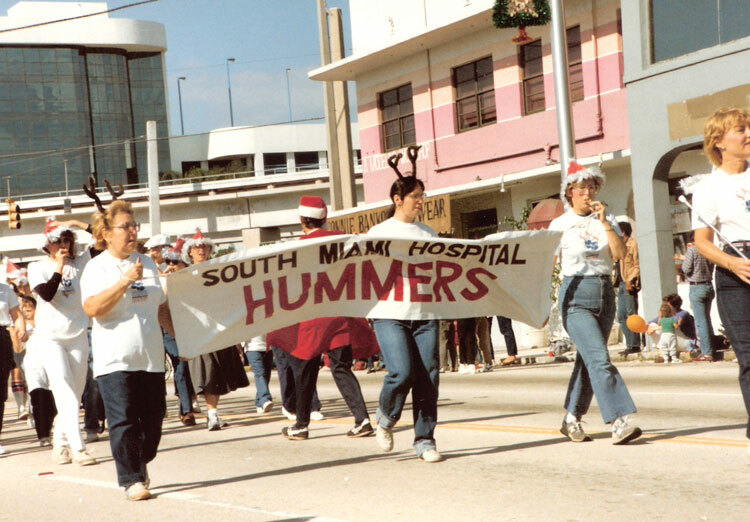 Barbara, a native of South Miami and professional corporate meeting planner was tapped by City Manager Bill Hampton and Mayor McCann in 1990 to organize the event. Barbara, who received a small stipend from the City to work throughout the year on the project, brought her expertise and powers of good-natured persuasion to bear on the parade’s success. 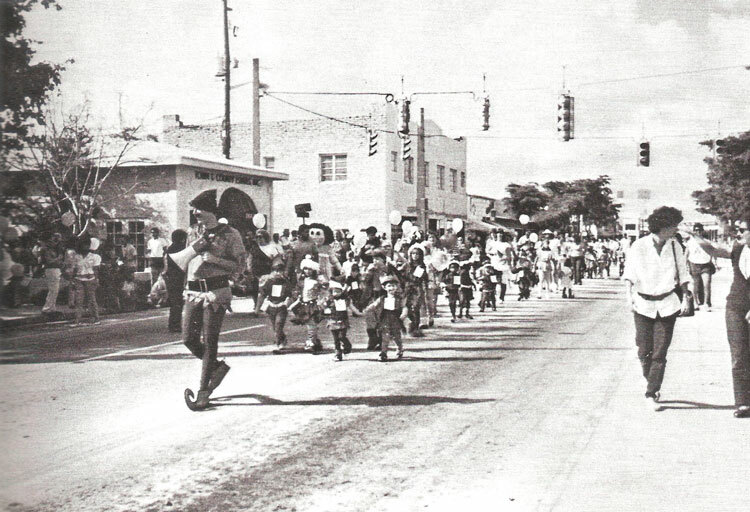 Barbara enlisted the South Miami Rotary Club to assist in the parade operations, and with good fortune Bill Enright, who had worked for years on the operational logistics for the Orange Bowl Parade. Rotarians continue to assist in the parade. Barbara coordinated the parade for 20 years until the City de-funded her stipend, citing budget constraints. Her final year in 2010 she volunteered one last time. “The children make it all worthwhile. 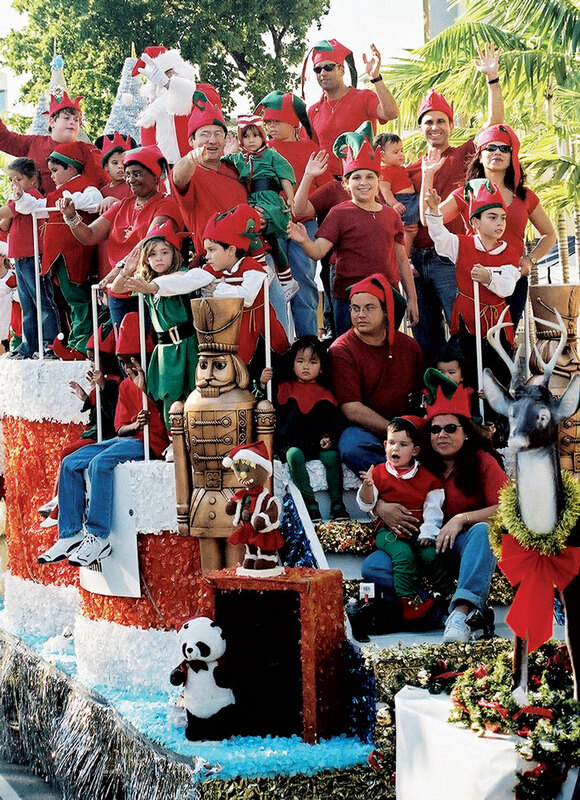 When a woman told me that her children were looking forward to participating in the parade with elf costumes they had designed and created, I had to volunteer,” said Barbara. During her tenure every year the number of participants grew and by 2010 there were 150 entrants in the line of march. 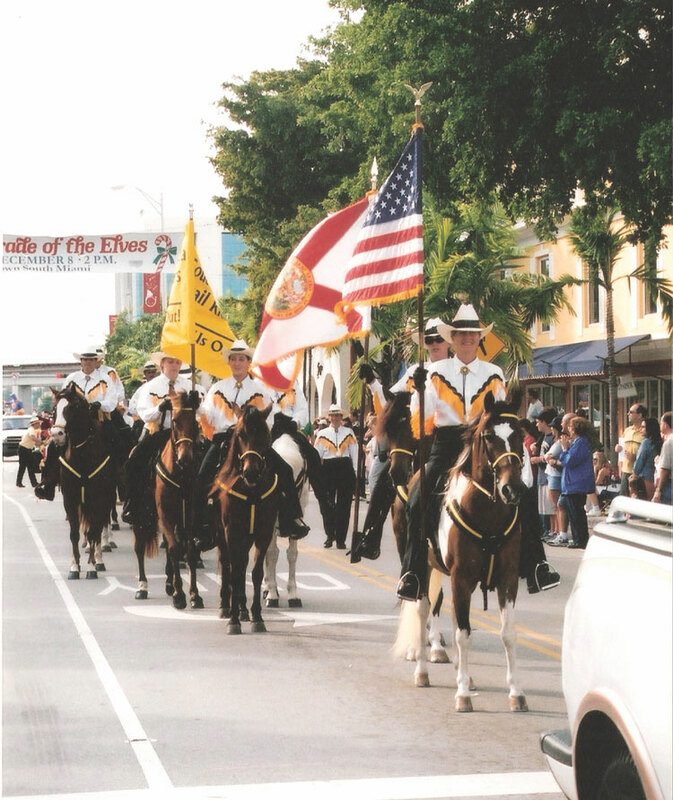 Some groups, such as the Trail Riders, the South Miami High School Band, St. Andrews Bagpipe Band and the Mahi Shriners continued to participate year after year. In those 20 years, crowds grew to 5,000 appreciative on-lookers. 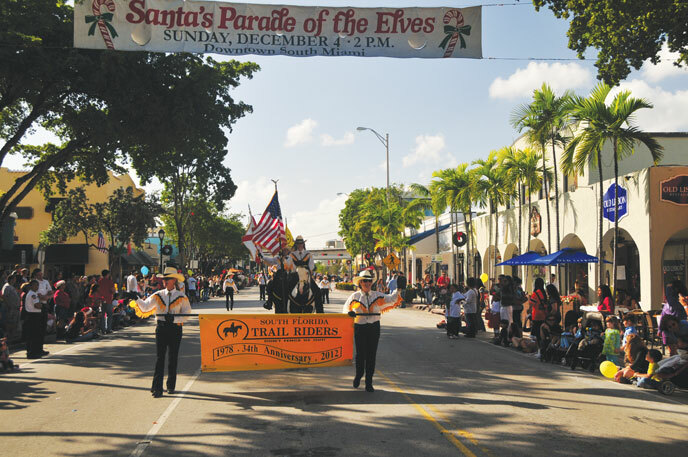 The parade featured 500 Elves, Scout Troops, church groups, decorated cars, floats and bicycles. And Santa made his annual appearance, now regally seated on his own special float. 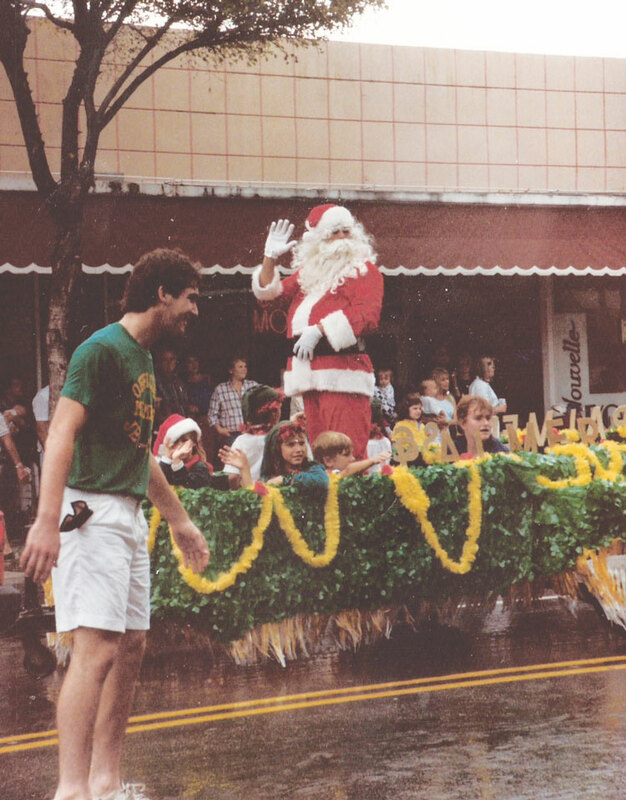 In special recognition of the 25th Anniversary of Santa’s Parade of the Elves (2008), parade founder John Sorgie and former Mayor Jack Block rode together at the front of the parade in a convertible. 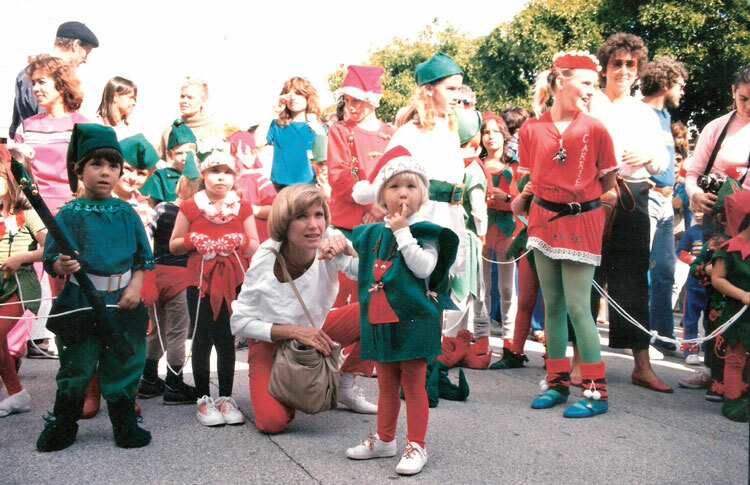 And Ashley Smith, the youngest elf in 1983, was chosen as the honorary Lead Elf. Ashley Smith, from youngest elf in 1983 to Lead Elf in 2008. Sponsorship again kept the parade alive in 2011 when things were beginning to look a bit doubtful. 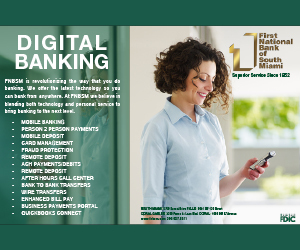 Veronica Flores, Executive Vice President of First National Bank of South Miami worked together with other business leaders and then City Manager Hector Mirabile to ensure that the parade would be a reality. Said Flores of the event and her rush to take on the challenge, “It’s all about the children.” Children marching along in homemade costumes will once again create happy memories. 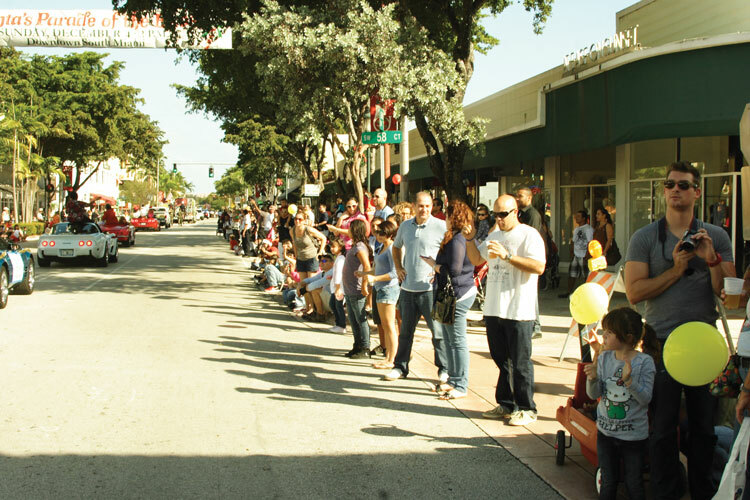 Today, the parade happens because the community believes in it and it happens because sponsors such as the City, First National Bank of South Miami, FootWorks, Chamber South, South Miami Hospital, SOMI Magazine, Branches and others support it with their donations of money and hard work. 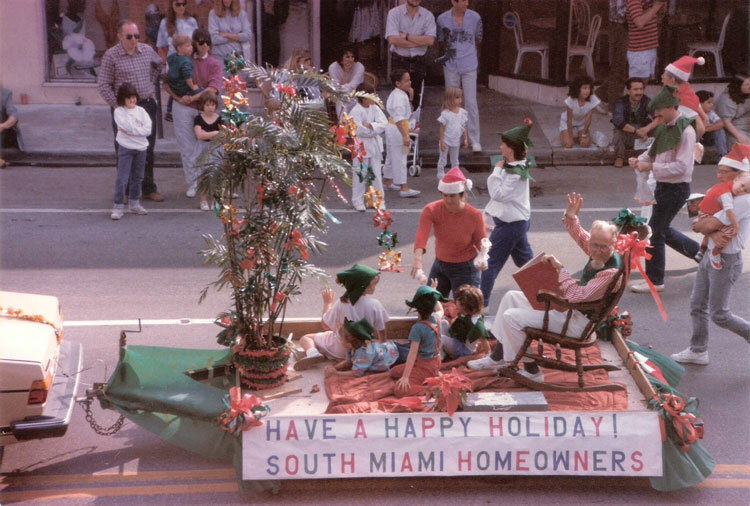 Carl Schwait, City Commissioner of South Miami from 1984 to 1990 played the role of Lead Elf in the parade for a number of the early years. 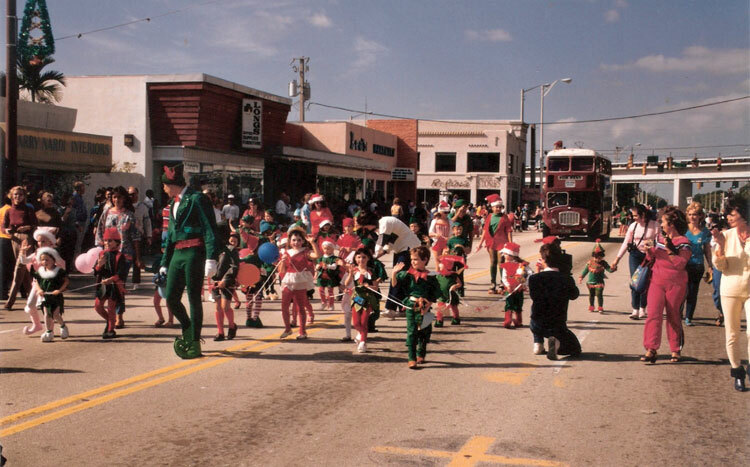 A photo of a tall man in a green elf suit, tights, pointy shoes and a hat leading little elves down Sunset Drive is perhaps one of the most endearing pictures from the early days of the event. 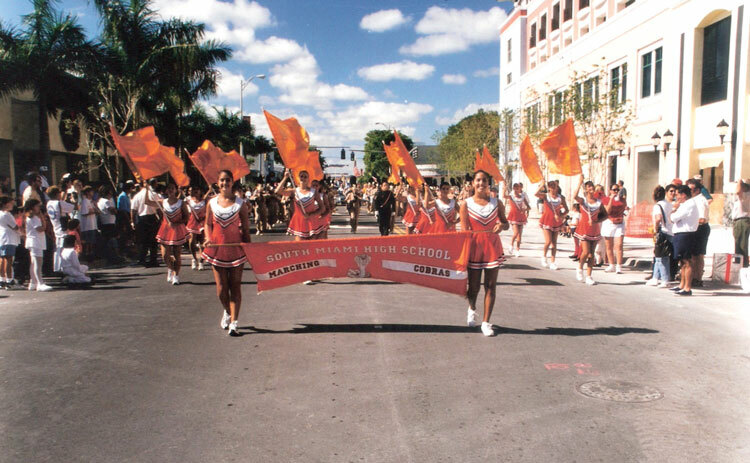 “The parade was one of the best things about being a commissioner in South Miami. 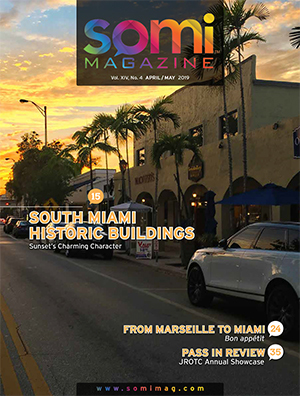 While the rest of Miami-Dade County was getting more and more urban, we were able to continue to enjoy our small town life,” said Schwait. And if you missed this year’s 35th, be sure to catch it next year; it’s always the first Sunday in December. The tradition continues in the lives and eyes of the new little elves…. 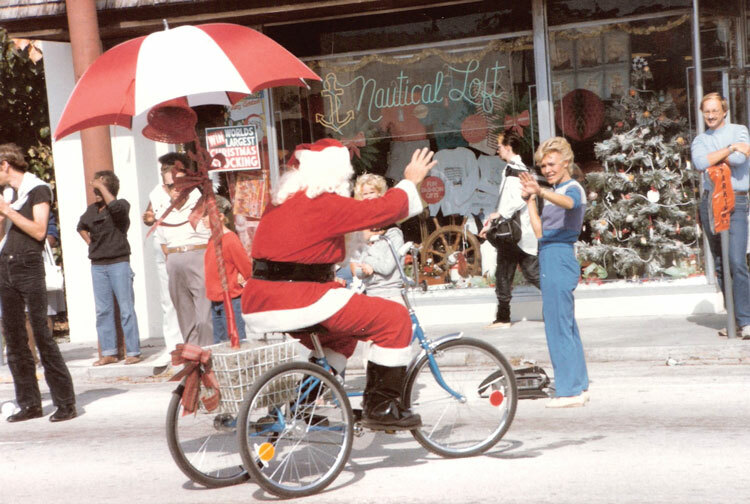 Over the course of the thirty years of the Santa’s Parade of the Elves, Santa has arrived in South Miami on a tricycle, in a convertible, on an antique fire truck, on a flat-bed and in recent memory on a superbly decorated float. 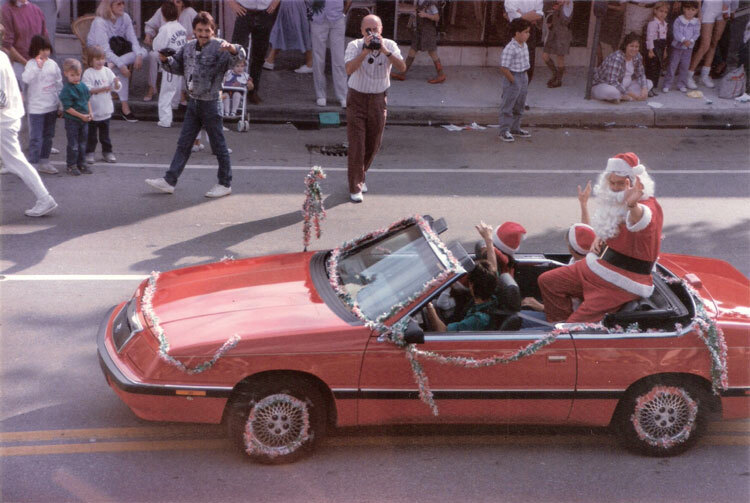 First National Bank of South Miami has enjoyed the honor of presenting Santa Claus since 1994.